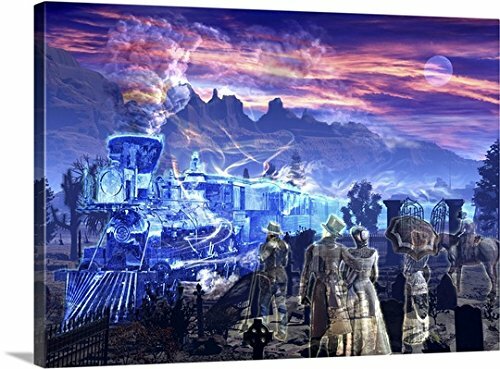 Gallery-Wrapped Canvas entitled 'Ghost train picking up some ghosts at a graveyard'. Ghost train picking up some ghosts at a graveyard. Multiple sizes available. Primary colors within this image include: Dark Blue, Sky Blue, Black, White. Made in the USA. Satisfaction guaranteed. Inks used are latex-based and designed to last. Canvas is a 65% polyester, 35% cotton base, with two acrylic latex primer basecoats and a semi-gloss inkjet receptive topcoat. Canvas frames are built with farmed or reclaimed domestic (pine or poplar) wood.